CALGARY, Alberta (Reuters) - Canada's battered oil industry is rooting for the opposition in next month's election in energy heartland Alberta, investors said on Wednesday, but a brewing scandal involving the party's leader could derail its hopes of an easy victory. Alberta contains Canada's vast oil sands, home to the world's third largest crude reserves. With an economy nearly the size of Ireland, the province contributes almost 15 percent of Canada's gross domestic product. Alberta Premier Rachel Notley's left-leaning New Democratic Party (NDP) came to power in a shock victory in traditionally conservative Alberta in 2015 in the midst of a global oil price collapse that slashed energy company revenues. But critics say Notley's government exacerbated the crisis by raising corporate taxes, launching a review of royalty rates and introducing a carbon tax at a time when firms were already struggling. 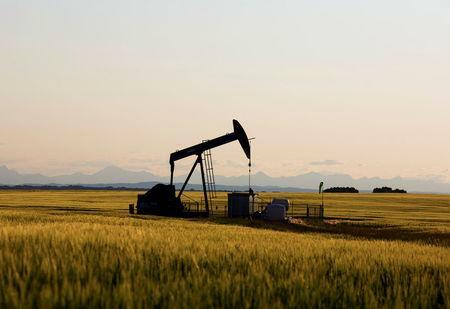 The sector accounts for 30 percent of the province's economic activity and supports 415,000 Alberta jobs, according to the Canadian Association of Petroleum Producers (CAPP). "A Kenney government would be very strongly welcomed by the oil industry," said Rafi Tahmazian, a senior portfolio manager specializing in energy investing at Canoe Financial in Calgary. "(In 2015), the sector was already on its knees because of commodity prices being low and the government entered into its role really not showing recognition of that." Kenney promises to cut corporate income taxes, a key CAPP recommendation, scrap the carbon tax, slash red tape, and fight for new export pipelines to bring Alberta's landlocked crude to market. "Our members are on their last legs," said John Bayko, spokesman for the Canadian Association of Oilwell Drilling Contractors, who added his organization would back any party that offered a strong vision for the energy sector. But industry participants recall her opposition to Enbridge Inc's Northern Gateway project, which has since been scrapped. Kenney casts himself as a far more forceful oil industry advocate. Appealing to some Albertans' sense of western alienation from national politicians in Ottawa, he vows to "stand up to Justin Trudeau and those attacking Alberta." Kenney's pugnacious approach has earned support from some in an energy industry that feels it lacks a champion. But it may also be the source of a growing scandal around his 2017 UCP leadership bid. Some Canadian media outlets have reported that Kenney's camp allegedly colluded with another candidate, Jason Calloway, to run a "kamikaze" campaign to discredit Kenney's main UCP leadership rival. Last week, Alberta's elections commissioner handed the Royal Canadian Mounted Police (RCMP) an investigation into irregular contributions to Calloway's campaign. "Any time there's potential of a leader being under investigation during an election campaign, that's a problem," said Duane Bratt, a political science professor at Calgary's Mount Royal University. Adding to UCP woes, a star candidate, Caylan Ford, resigned on Monday after a media report claimed she posted comments echoing white supremacist rhetoric on Facebook. Ford said the comments were distortions and did not reflect her views, but resigned to avoid becoming "a distraction." Bratt said these developments offered some hope to Notley's NDP government in the April election, but the UCP was still the clear favorite. "A week ago, I would not have thought there was much of a path to victory for the NDP," he said. "Now I think there's a slim path, which is better than none."